If like us, you were delighted by recent videos of Harry Potter star Emma Watson leaving free feminist books on the New York City Subway and the London Underground, there’s now a similar project underway closer home. A Delhi couple is trying to share their love of reading with their fellow metro riders by leaving books in metro trains and metro stations. Called ‘Books on the Delhi Metro,’ the non-profit project was started a month ago by Shruti Sharma, a writer, and Tarun Chauhan, a civil engineer. After the couple drop off a book marked with a ‘Books on the Delhi Metro’ sticker on the Delhi Metro, they immediately post clues about its location on their Twitter, Instagram and Facebook accounts. 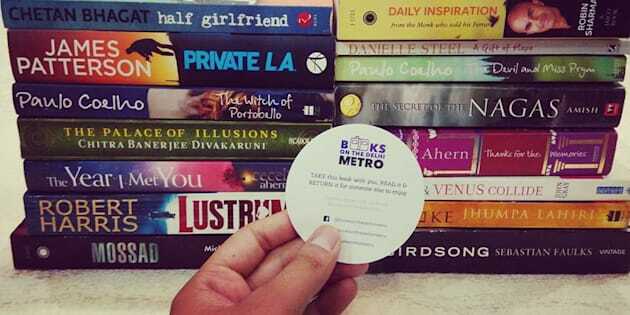 Anyone who picks up the book is encouraged to post about their discovery using the hashtag #booksonthedelhimetro, read the book and eventually return it to the Delhi Metro for someone else to read. Sharma was inspired to start the project after watching a video of Watson dropping books the New York City Subway earlier this year. The idea intrigued Sharma and Chauhan, who both spend at least a couple of hours on the metro everyday and carry their own books to read during the commute.After a Google search, Sharma discovered that Watson had collaborated with Books on The Move, a global initiative that encourages people to read on their daily commutes by leaving books on public transport. Started as a mobile library in London in 2012, ‘Books on the Move’ now has 20 branches in 14 countries. Sharma wrote to them to get permission for starting an Indian branch. The Delhi Metro project finally took off last month. “The main aim is to get people to read more, I don’t want them to be just hooked to their mobile phones or watching videos.” as told by Sharma. She has left three books on the Metro so far — Jhumpa Lahiri’s The Namsake, Arthur Conan Doyle’s Case Book of Sherlock Holmes, and Cecelia Ahern’s The Year I Met You. Only one was picked up by a commuter, but she is hopeful that this will change as more people hear about the project. The couple plans to leave at least one book a week, and gradually increase the frequency, while also introducing Hindi books. So far, the books have been drawn from the couple’s own collection but eventually they plan to organize book donation drives. The couple is also inviting fellow book lovers to donate books for the project. The Article was originally published in HuffPost.